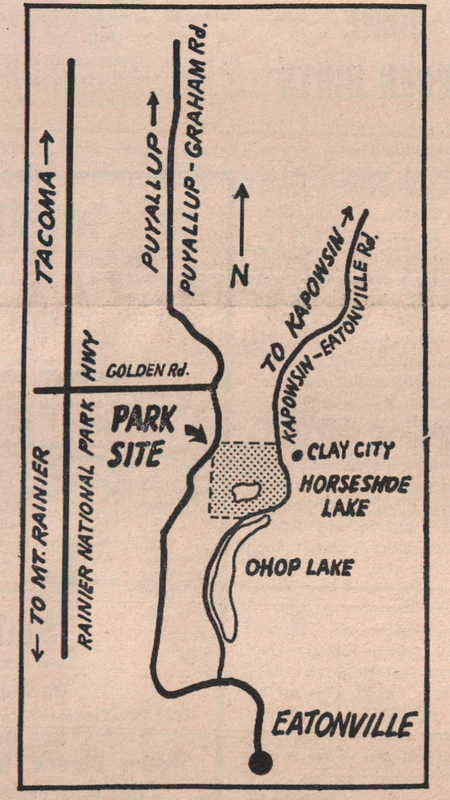 Forty years ago, in 1971, an article ran in the Dispatch about the development of a “535-acre Zoo-Park”. This facility, tentatively called Northwoods Trek, would “exhibit, propagate and preserve predominately native Northwest and Alaska species of wildlife in their natural habitat,” and potentially bring in 500,000 people a year. A local couple — Dr. David Hellyer and his wife Connie — had already donated the large tract of land. He was a 58-year-old Tacoma pediatrician and they operated a cattle ranch outside Eatonville. Their gift was substantial in more than just acres. The couple had recently been offered $1 million for the site by a developer — approximately $5.5 million in today’s dollars. Plans were already in the works for this self-supporting Zoo-Park. It would be stocked with elk, buffalo, antelope, moose, muskoxen and more; and the offspring would stock the Point Defiance Zoo. The whole thing sounded a little like Noah’s Ark. Then Parks Director, W.O. Glundberg told folks that for the next year, one pair of each kind of animal would be released in the park to determine the numbers of each species the acreage could support. A $50,000 loan was being secured to pay for a two-year animal acquisition program. How they were going to move people around this zoo-park was still a mystery. There was talk though of an “aerial tramway” to allow visitors great views. 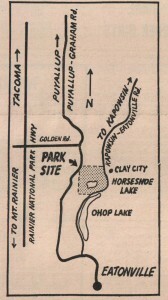 The article ran in 1971 and Northwest Trek opened to the public in 1975. • The park has grown to over 722 acres. • Attendance never did reach 500,000, but a 210,356 record was set when the grizzly and black bear exhibit opened in 1993. • Since it opened, over 4 million people have visited. • In 2006 Dr. Hellyer passed away, leaving an amazing legacy.